Because factors such as climate, soils, distance from other remnants and past management vary from one site to another, the ecological processes associated with each site also vary. This means that there are no set recipes for management. Rather, management needs to be a trial and error process based on the best available information. Adaptive management is an approach that many landholders have intuitively used for decades, but in order to maximise its effectiveness, it is important to monitor and consider the outcomes in an ongoing way, that can perhaps best be described by this diagram. This process is called 'adaptive management'. In essence, adaptive management treats management actions as experiments. 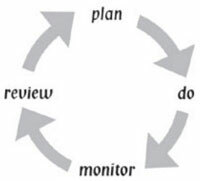 Starting with an 'educated guess' about management regimes (developed from personal experience, published research or communication with others), the management team (often a landholder working with advice from a scientist) records the technique to be used and the expected outcomes (which are preferably defined in measurable terms). The team then implements a particular management activity and compares the result with the expectations. If the activity did not achieve the expectation, the manager then adapts the technique in light of the result and tries again. This approach has been widely used to adapt weed control techniques to local conditions. It is also used intuitively by many landholders, although sometimes they do not have all the information available to them. Determine how change and success will be evaluated (e.g. absence of living weeds one month and one year after removal).